I think the question explains it all. I'm increasing the stroke size of an arrow, but the arrow head becomes really large. How can I prevent the arrowhead from increasing with increasing stroke. Btw, I tried different arrowhead shapes. And this didn't help. 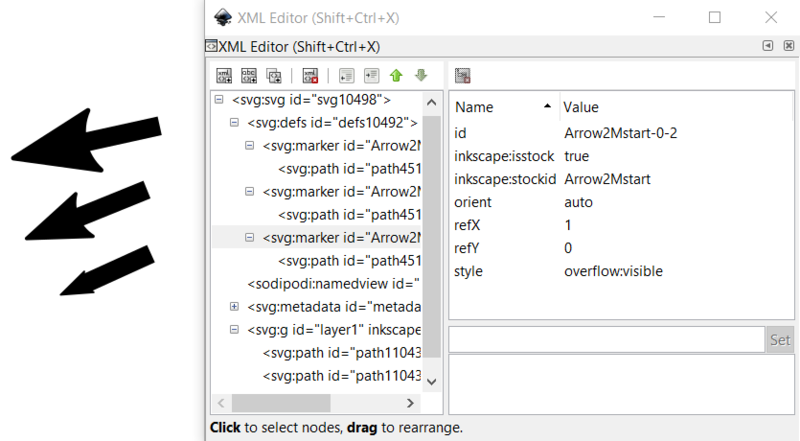 You can use the XML Editor to adjust the scaling and positioning of the arrow head, leaving the stroke width unchanged. Expand the defs id, and locate the marker id, and expand that too, and you will find a path id. The beauty of this is that it doesn't break the arrow head functionality of the stroke. You can still edit the path, and the arrow head will move as expected. Also, you can use this technique for multiple paths - each marker id, and path id can be adjusted separately. Draw a horizontal line and set the arrowheads you like. Scale the line until it has the thickness you need. Ungroup. The two arrowheads are now separate objects. Scale them down to the right size. Select one arrowhead, do Objects > Object to Marker. Repeat with the other. You can now select the properly sized arrowheads in the Stroke Style palette and use them normally. Inkscape's marker collection has the arrowheads in several sizes as an inbuilt workaround. 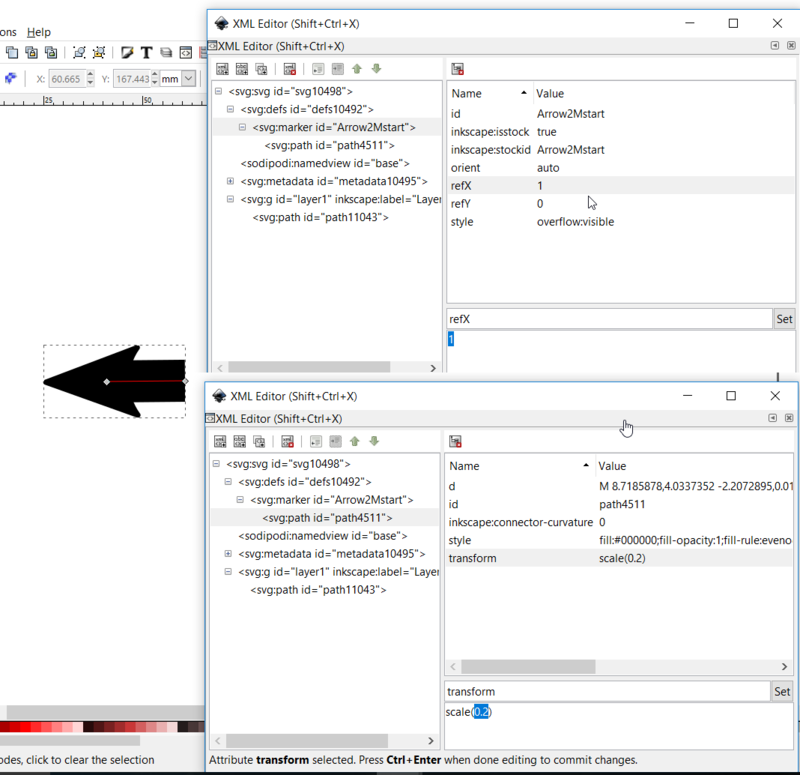 If the available sizes are wrong, another workaround keeping the default behaviour of the program is to duplicate the stroke without the arrowheads and make the duplicate thicker. It must be shortened a little, too. This method is not useful if there's plenty of paths with the same problem or they must still stay easily editable. The wanted selection is possible in the objects panel when there are more than one object at the same place. Not the answer you're looking for? Browse other questions tagged inkscape resize stroke or ask your own question. How can multiple arrows be created along a path in inkscape? Does stroke add on the outside or inside of an object in Photoshop?